Six percent of students begin college intending to major in Science, Technology, Engineering or Mathematics (STEM) but do not complete their STEM degree. For underrepresented racial and ethnic groups, the failure rate is 80 percent. During the first two years of college, the introductory courses of STEM are the only exposure to science for all students. The failure of delivering engaging and effective introductory science is a problem for both future scientists and a vast number of undergraduates. The Freshman Research Initiative Program will help reduce the number of students who abandon their pursuit of science and engineering degrees during college. Howard Hughes Medical Institute is a science philanthropy with a mission to advance biomedical research and science education for the benefit of humanity. In 2013 Howard Hughes Medical Institute issued a challenge to research universities to develop effective strategies that will lead to significant and sustained improvement in the persistence in science for all students, including those who belong to groups underrepresented in science. The University of Texas at Austin is among 37 universities receiving a total of $60 million in grants for the Hughes Medical Institute’s 2014 competition. In addition to receiving funds from extramural sources, the University of Texas at Austin is also actively encouraging researchers to translate their research into business practice. This month the university announces an early-stage startup competition for the Food Lab Challenge launching June 1st. Entrants will compete for $30,000 in prizes to launch their business ventures. Participation in this competition is not the only way to connect with the University of Texas at Austin, Biotechnology Calendar, Inc. also provides an opportunity for lab supply companies to network with Austin researchers at the 4th Annual BioResearch Product Faire™ Event on September 17th 2014. 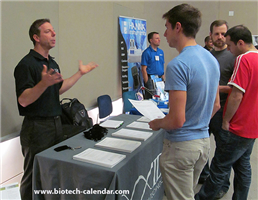 Each year Biotechnology Calendar, Inc. organizes about 200 research professionals at the BioResearch Product Faire™ Event located at the University of Texas at Austin, and lab supply companies have a plenty of time to make new connections and promote their products to these research professionals. 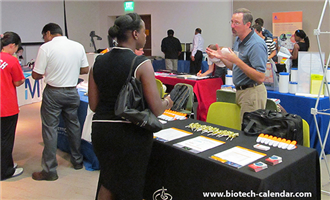 Last year, the BioResearch Product Faire™ event at the University of Texas, Austin attracted 187 attendees. Of these attendees, 39 were purchasing agents, professors and post docs, and 30 were lab managers. These attendees came from 15 different research buildings and 20 on-campus departments. If you are a laboratory supply company and would like to exhibit at BioResearch Product Faire™ Event on September 17th 2014, please click here for more information. Biotechnology Calendar, Inc. brings more than 60 events at different institutions across nation. Please read the National Show Schedule for 2014.